Located about 30 miles northwest of Budapest, Esztergom sits on the right bank of the Danube River where it forms the border between Hungary and Slovakia. It makes a perfect day trip from Budapest. The city was the capital of Hungary from the 10th century to the middle of the 13th century and is currently the seat of the Roman Catholic Church in the country. 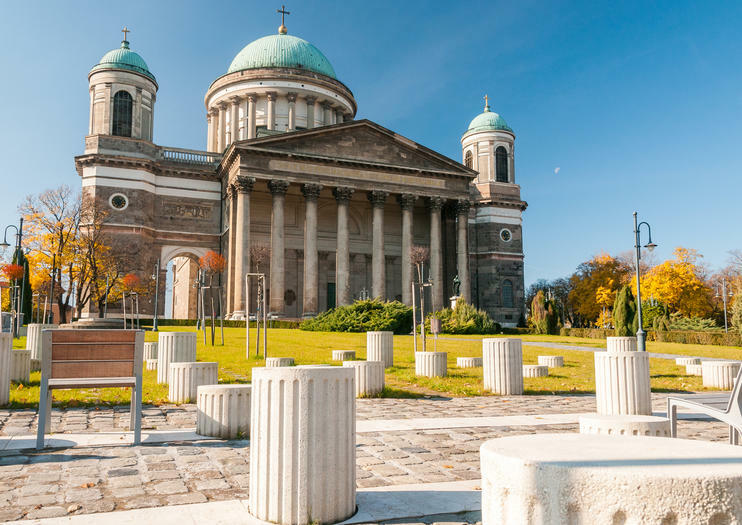 The most popular sight in Esztergom is the Esztergom Basilica, the largest church in Hungary. Standing atop Castle Hill, entrance to the church is free, but visitors must pay extra to visit the crypts, cupola and treasury. Next to the Basilica is the Castle Museum, which is free and well worth a visit – especially for its views over the Danube. The Christian Museum can be found in the Primate’s Palace and boasts the largest collection of ecclesiastical objects in all of Hungary. If time permits, check out the Balint Balatta Museum, featuring displays on local and regional history. To reach Esztergom from Budapest, take a local train from Budapest’s Nyugati train station or take the bus from the Arpad Bridge Volan bus station in Pest. The train station in Esztergom is about a 30-minute walk from the center of town, while the bus station is right in the town center. A more interesting route would be to take a EuroCity train from Budapest’s Keleti train station to Sturovo in Slovakia and then walk a short distance to Esztergom over a bridge crossing the Danube. Use Vienna as a jumping-off point to continue your travels around Europe—and visit both Slovakia and Hungary—on this private tour. Following pickup from your Vienna hotel, spend the first day in Slovakia. Drive to the capital of Bratislava, tour farms and castles, and explore the picturesque High Tatras Mountains. After an overnight stay at a mountain hotel, take a cable car to Slovakia’s highest point (own expense), and visit the UNESCO-listed village of Vlkolinec. Arrive at Budapest in the evening, where you’ll finish the tour at your local hotel. Take the scenic route from Bratislava in Slovakia to Budapest in Hungary on this 2-day one-way tour. Travel in the comfort of a private vehicle and stop as many times as you like to admire the views and take photos at Strbske pleso lake, Strecno Castle, and Cicmany Village. Highlights include the UNESCO-listed village of Vlkolinec and the view from Lomnicky, the highest peak in Slovakia’s High Tatlas Mountains.